Growing up in the small farming town of Carp, Ontario in the Ottawa valley, Joanna started her triathlon career after playing soccer, basketball, roller hockey, football, volleyball, rhythmic gymnastics, and horseback riding and realizing that she lacked the coordination necessary to excel at any of these sports. Seeking an activity that requires only forward movement, Joanna came across a triathlon camp in Ottawa hosted by the Bytown Storm. At the age of 14 and under the guidance of Triathlon Ontario Provincial Coach Greg Kealey, Joanna would discover her passion for triathlon. 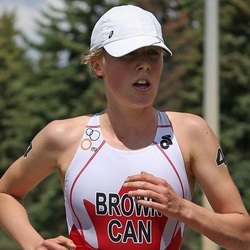 ​Joanna represented Canada at the 2015 Pan American Games, and is one of only two Canadian triathletes to have medaled at both the ITU World Jr and U23 Championships.​ With the 2016 Rio Olympics on her radar, Joanna currently trains under the experienced guidance of Craig Taylor, Head Coach of the Triathlon Canada Performance Centre in Guelph. Joanna is a recipient of the Bronze Governor General’s Academic Medal and University of Guelph Academic Entrance Scholarship, and is a 3-time CIS Academic All Canadian.